As Our Lady is the model of humility par excellence she did not approach the Divine Savior without having manifested all the respect and all the admiration that He merits. As the most exquisite creature of Creation, she could not help but take this humble position before the Savior. Being infinitely below the Creator, even though she is the highest creature, she directed herself to Our Lord as if she were the least of His creatures. Let us imagine a person who thinks he is closer to the sun because he is four inches taller than the normal man. This is ridiculous, since four inches is nothing compared to the distance from the earth to the sun. God being infinite, even the great distance that separates us from Our Lady is small next to what separates her from God. So, we can understand the many acts of humility that she made in the presence of the Divine Child. Her action came not from a self-centered humility, but a God-centered one. Rather than think about her limited condition as a creature, she considered the infinite greatness of God. Therefore, in the cave of Bethlehem, her first affections were acts of admiration, manifesting all that she admired in her Divine Son as God-Man. In this there is a logical order. When we love someone very much, we must begin by admiring him. It is not sentimentality, like a girl admiring her doll, for example, but admiration that is the foundation of love. She loved that newborn Child, knowing He was the most admirable of all creatures, hypostatically united to the Divine Word. By a supernatural revelation, Mary knew that the Son generated in her was the Son of God. So fragile and tiny, and yet God in His infinite greatness, in His immeasurable admirableness! Her first thought most probably was turned toward the most grandiose aspect of the Divine Being; only then did her thoughts turn toward the Child. With this came the motherly love, contemplating in His gaze God, who was reflected there. 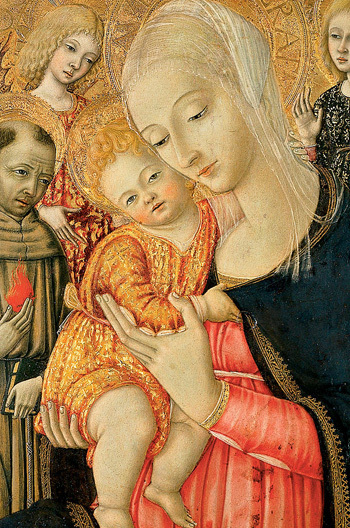 Our Lady looked at His tiny Body, touched His arms and felt they were cold from the winter weather. In this way she expressed a mother’s tenderness. Someone might object that at this moment the admiration disappeared, and only affection manifested itself. This is not true, because at the moment admiration dies, affection disappears – just as admiration is extinguished the moment that affection dies. When a mother gives birth to a child, that baby is so charming that she is overtaken by a great tenderness. In the subconscious of the truly Catholic mother, the following passes: This newborn is like an angel. How much grandeur there is in a human being called to a long life, with his serious duties to God: to be a good son of the Catholic Church; to dominate his passions; to sanctify himself and go to Heaven for all eternity. How extraordinary! I am deeply moved, seeing how such a great call is contained in this tiny newborn! With this consideration comes a very great tenderness, but also a great admiration: What an admirable mystery it is that I, a human being, have begotten another human being! He was formed in my womb, he was born to me, nourished by me. I liberated him to life, and here he is, so small. In his very existence there is an immense mystery! Regarding the Holy Mother of God, we can think of the hour when God, bending over that embryo, breathed a soul into it, giving something that the mother did not generate, that does not proceed from the nuptial act, but from the Creator. What a magnificent thing this is! In the tenderness of a true and well-oriented mother for her child, this whole series of mysteries that took place in her appears. The birth of another creature that is flesh of her flesh and blood of her blood, "another myself," another being upon whom God breathed an immortal soul. That is, the work of God was added to the mother's work for something vastly larger. This bond of soul opens the horizons for that child: Horizons of struggle, dedication, joy and victory. But also horizons of sadness, retreat and weaknesses, when one must ask God for graces to support them. In this we see another aspect of the birth of a simple child. For the Church, the life of every creature is comparable to that of a hero who prepares himself with exercises for the fight, so that he can confront life and engage in the combat, of a hero who takes up his weapons and shield to enter the arena of life. It is the beginning of a huge battle, and thus the mother could say to a child: My warrior, I admire you because you are fighting the good fight! This is your duty. Once you receive baptism, grace will call to you and begin a supernatural life in you, more or less like a candle that someone lights. How much will it illuminate your soul? How much good will you do? What glory will you give to God? On that night, the Blessed Virgin probably was thinking of how the public life of her Divine Son would begin, the miracles He would work, the souls that He would attract. She was thinking of what would result from this, of how He would begin to be rejected by the Jews, forgotten by His own Apostles because of their softness, and even betrayed by Judas. She also most likely pondered on the Pentecost, the expansion of the Church throughout the Mediterranean basin and the mysterious places where the Apostles would walk, filling the Earth with their presence. She meditated upon the liberation of the Church by the Emperor Constantine; on the Church that would shine throughout the world; on the invasion of the barbarians and the civilization that came from their conversion; and, then, on St. Benedict, who in Subiaco would become the Patriarch of the West and implant a new spiritual life from which the Middle Ages would be born. She would probably have lamented that, at the end of the medieval period, in a contestation to the work of St. Benedict, an immense sin would be committed and would start the Revolution, which would raise up waves of atrocious injuries: the Renaissance, Humanism and Protestantism. From this would follow the French Revolution, Communism and an Anarchist Revolution, also known as the Cultural Revolution – enigmatic, difficult to define in its true contours, infamous in all that we already know of it. Our Lady would reflect on all this. But she would also rejoice that, by her design, over this sea of filth a rose petal – the Counter-Revolution – would begin to float at a certain moment, attracting her faithful sons to fight for her in our century. At the foot of the crib, one can turn to analyze his own individual history: How the grace of God was accepted by his soul, the ups and downs, his correspondence to grace and rejections of it, his movements of pride and sensuality, the victories and, at times, defeats, but always the role of God's mercy striving to bring us to the right path. Our Lady foresaw that some would fall along the way; she would await the prayer of those who remain for those who have fallen; and from time to time she would manage to bring a son back to the right path. She also saw beforehand her final intervention and the implanting of the Reign of Mary that she revealed at Fatima in 1917. We should consider all this when we are at the foot of the crib and say: O Infant Jesus, You are the dividing stone, the rock of scandal that divides history into two parts. Today, everything that is with You is the Counter-Revolution, everything that is against You is the Revolution. 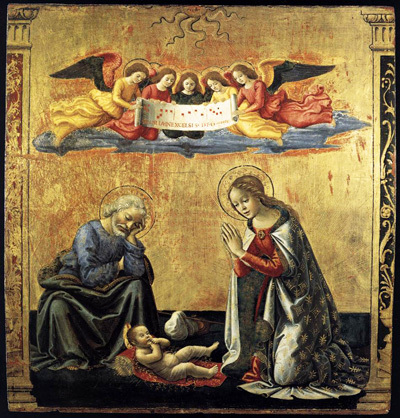 We can raise this prayer as we venerate at the crib: Here is a son, Our Lord Jesus Christ, brought to You by the grace of Your heavenly Mother, by her prayers, by her womb. Here is a son kneeling before You to give You thanks, and to present himself toYou as a warrior ready to battle for You in the Counter-Revolution, confident of Your grace.